Mercado de San Miguel – Where's my paintbrush? The San Miguel market is located in the heart of Madrid’s tourist center, right next to the Plaza Mayor. Completed in 1916, it is the only surviving iron structure market in Madrid today, having been rescued from abandonment and disrepair by a group of investors in 2003 who restored and reopened it in 2009 and adapted it to the the 21st century. By day, the market is a bustling venue for vendors offering fish, produce, cheese, bread, pastries, and cafes to enjoy a mid-afternoon cortado. 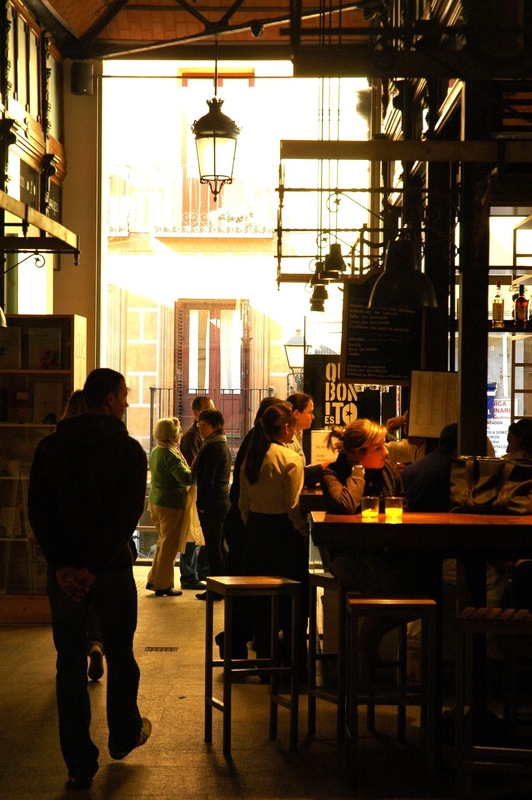 By night….correction, this is Spain after all: By day and night – it’s a collection of beer and wine bars where one can enjoy tapas such as tortilla española, fried shrimp, and tuna while sipping your beverage of choice. At any time, the mix of locals with tourists makes for some fantastic people-watching, and the overall experience is overwhelming as you squeeze (or in my case, push) your way through the crowds and go station to station ogling the food and sampling the tapas, all while trying to figure out a plan of attack to try everything and see everything and stay on budget. The experience engages all the senses: the smells of the food, the noise and bustle of the crowd, the sight of the beautiful produce, the feel of the water droplets in the air (green A/C), and the taste of the jamón ibérico. 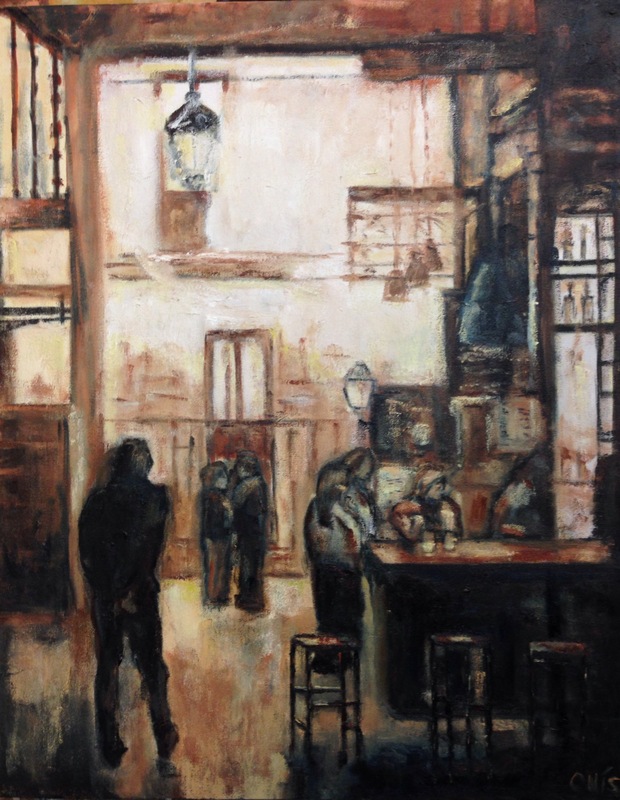 I give you this backdrop because my close friend P, who has so far inspired five of my paintings with his incredible photographs, captured a very different view of Mercado San Miguel – a calmer, more peaceful one that reminded me how beautiful the light can be in Spain. I don’t know what time of day the photograph was taken, but the light is strong, coming from a high position in the sky. The shopping rush is over and it’s not café or tapas time either. I’m guessing the photograph was taken soon after lunch (la comida, at 2 PM), around 3:30 or 4:00 PM. I wanted to paint the scene not just for the different view of Mercado de San Miguel that it represented, but also because I knew I needed more experience working with such strong lights and darks (value). I faced three challenges in translating this beautiful photograph to the canvas. First, the photograph depicts a clear foreground, middle ground, and background. To depict that with oil, I would need to ensure correct use of shades within my chosen palette in the correct places on the canvas. Second, I had to be patient to build up the bright light in the background so that it wouldn’t just be a stark white glob. Third, I entered a period of intense creativity, tight deadlines, and a hectic travel schedule at my day job that made consistent studio work difficult. The process of bringing P’s photograph to the canvas was interrupted and inconsistent over a three-month period, but I am pleased with the results. I think the long breaks between working on it may have even helped, as they gave me time to think about my subject and study my progress to understand what I had to do the next time I made it to the studio. It also gave me time to reflect on my memories of the lazy Spanish post-comida hours, that sleepy, relaxed time when Spain slows down so much it is unrecognizable from the morning bustle. I hope, dear readers, that you enjoy this piece as much as I enjoyed creating it and thank you for letting me share it with you. I like the ‘anytime’ treatment of the image. One can imagine Hemingway sipping a jerez while scribbling notes that will make it into the Sun Also Rises or For Whom the Bell Tolls.